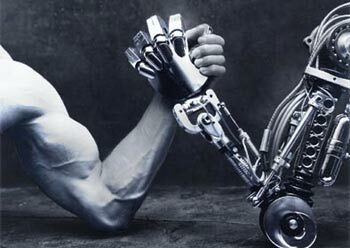 Philosophical Disquisitions: Will technological unemployment lead to human disenhancement? Will technological unemployment lead to human disenhancement? I have written a lot about the prospects of widespread technological unemployment; I have also written a lot about the ethics of human enhancement. Are the two topics connected? Yes. At least, that’s what Michele Loi tries to argue in his recent paper “Technological Unemployment and Human Disenhancement”. In this post, I want to analyse his argument and offer some mild criticisms. I do so in a constructive spirit since I share similar views. As you might guess from the title, Loi’s claim is that the displacement of human workers by machines could lead to widespread human disenhancement. This is due to the differential impact of technological unemployment on the mass of human workers: some will find that technology has an enhancing effect, but most will not. This is supported largely, though not entirely, by the work of the economist David Autor (discussed previously on this blog). Autor is famous for describing the polarisation effect that technology is having on the workforce. In essence, Loi’s argument is that this polarisation effect is likely to result in disenhancement. This might sound confusing right now but it should all make sense by the end of the post. I’ll break the discussion down into four main parts. I’ll start by looking more closely at the concept of ‘disenhancement’; then I’ll outline Loi’s main argument; then I’ll look at his defence of that argument; and then I will close by presenting some limited criticisms of that argument. One of Loi’s goals is to demonstrate that there is an interesting connection between the economic debate about technological unemployment, and the bioethical debate about human enhancement. To prove this he needs to define his terms. Since ‘disenhancement’ is simply the inverse of ‘enhancement’, it makes sense to start with the latter. But anyone who has been paying attention to the enhancement debate for the past decade or so will know that clear definitions are an elusive quarry. There are so many sub-categories, sub-definitions and terminological kerfuffles, that it is hard to keep up. Loi says we need to understand two things to keep up with his argument. 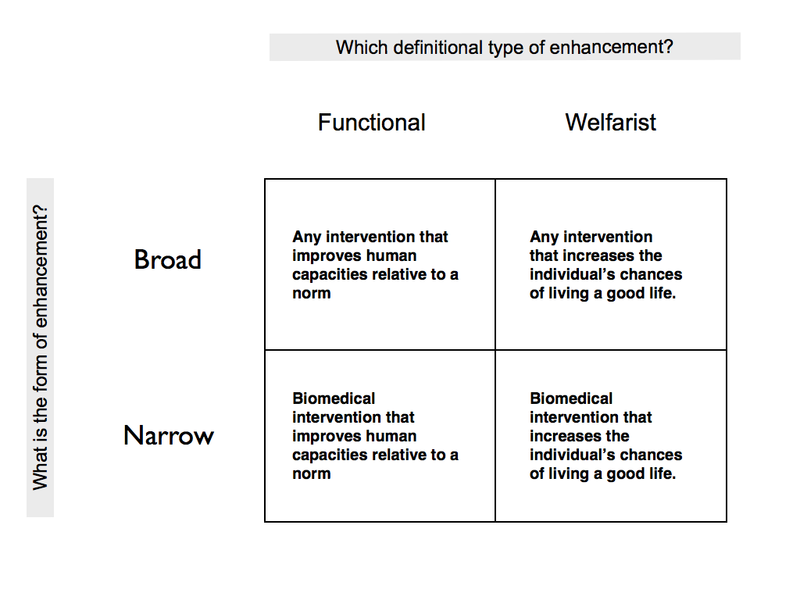 Functional Enhancement: Person X is enhanced if their capacities and abilities are improved (or added to) relative to some species-level or population-level functional norm. Welfarist Enhancement: Person X is enhanced if the likelihood of their life going well is improved, relative to some set of circumstances. Functional enhancement is more in keeping with what people generally mean when they think about enhancement. It assumes that there is some normal level of human ability and that the enhancing effect of a technology or intervention must be judged relative to that norm. Welfarist enhancement is a slightly more recent development, associated largely with the work of Savulescu and Kahane. It focuses on the individual’s welfare, not the general norm, and holds that the enhancing effect of a technology or intervention must be judged relative to the individual’s life and circumstances. The functional definition is inherently moralised because of how it implicates a norm; the welfarist definition is more about prudential well-being and hence less moralised. Loi wants his argument to cover both types of enhancement. Narrow Enhancements: Biomedical technologies that directly target biological capacities and have an enhancing effect. Broad Enhancements: Any intervention — including non-biomedical technology, education, political governance etc — with an enhancing effect. Although much of the bioethical debate is concerned with narrow forms of enhancement, Loi thinks it is difficult to maintain a principled distinction between the two. Indeed, the fuzziness of the distinction is something that is routinely exploited by proponents of enhancement. They often try to argue for biomedical enhancements on the grounds that they are not substantially different from broader enhancements to which no one has an objection. John Harris is probably the quintessential exponent of such arguments. If you like, you could categorise enhancement arguments using these four concepts — as in the diagram below. This might help you better understand the argument you are dealing with. In fact, it might even help us to understand Loi’s argument. Loi’s argument uses a broad definition of enhancement, and focuses on both the functionalist and welfarist types. This means he is concerned with the right half of the matrix given above. Of course technically, Loi is concerned with ‘disenhancement’ not ‘enhancement’, but that only means we have to invert the definitions in our mind. In essence, he is trying to argue that technological displacement in the workplace will have a disenhancing effect in both the welfarist and functionalist sense. (1) A technology is disenhancing if it reduces or subtracts from ‘normal’ human capacities (functionalist sense), or if it reduces the chances of someone’s life going well, relative to some set of circumstances (welfarist sense). (2) Technological displacement at work gives rise to a polarisation effect: it pushes some people into highly-skilled, abstract forms of work, but pushes most people into lower-skilled, less rewarding forms of work. (3) If people are in lower skilled or lower paid forms of work, then they will witness a reduction in their normal capacities and the chances of their lives going well will be reduced. (4) Therefore, technological displacement at work leads to disenhancement. This is messy, but I think it does justice to what Loi is trying to say. The first premise appeals to the definition of enhancement that Loi favours in his article. It should not cause any great controversy. The second premise is the key empirical support for the argument and, as I mentioned in the introduction, is based largely on the work of the economist David Autor (though Loi mentions others, including Autor’s collaborators). The third premise is where Loi’s real contribution to the debate comes: it links technological unemployment to disenhancement. Loi doesn’t set it out in these explicit terms — and that may be one of his argument’s main flaws — but something like it does seem to be implied by what he says. The conclusion then follows (for those who care, the argument’s structure is roughly: A = B; C → D; D = B; therefore C → A). I’ll go through Loi’s defence of premises (2) and (3) next, but before I do so it’s worth noting something about Loi’s overarching goal. As he himself makes clear, he is not trying to offer concrete predictions about the future. He acknowledges that there is a large degree of empirical uncertainty in his argument. Rather, his goal is to simply identify a plausible scenario and tease out its ethical and social implications. This means we are better-armed when the technological changes come. This strikes a chord with me since I approach my own work in a similar light. The second and third premises of Loi’s argument are all about the effect that technology has on the workplace. The traditional view — heavily influenced by the first wave of automation during the industrial age — is that machines replace human workers in the performance of arduous, routine physical tasks. Hence the takeover by machines of certain types of agricultural and manufacturing work. This, arguably, has had a long-term enhancing effect: it gave people the opportunity to work in more challenging, cognitive forms of employment. This is no longer true. With the rise of computerisation and machine learning, technology is taking over from more and more cognitive work. Indeed, there is an interesting paradox, first observed by Hans Moravec, to the effect that machines are good at taking over routine work. This includes certain constrained physical tasks, but far more rule-based cognitive tasks (e.g. computing itself was a task once performed by human workers). Such tasks represented, for much of the 20th century, the core of the middle-skill, middle-income jobs that made a prosperous middle-class possible. These jobs are now slowly eroding in the wake of automation. This is giving rise to a polarisation effect. It turns out that there are two types of work that are hard to automate. David Autor refers to these as “manual” and “abstract” work, respectively. Manual work is anything that requires fine sensorimotor skills and includes things like fruit-picking, food preparation, and cleaning. Though there are some initial forays into the automation of these tasks, it requires far more computing power to replace humans in these jobs than it does in the middle-skill cognitive jobs. Abstract work is anything that requires high levels of analytical ability and creative thinking. It includes things like entrepreneurialism, certain forms of managerial work, and high-level professional services. These are also difficult to automate, but benefit a lot from the automation of the middle-skill cognitive jobs (e.g. because abstract workers can now use computer technology to cheaply perform their own data analysis and processing). With the automation of the middle-skill jobs, the workforce is being polarised into manual and abstract forms of work. The problem is that these forms of work are very different in character. Manual work is generally viewed as being low-skill and is often precarious and poorly paid. Manual workers tend to have little on-the-job autonomy and may find their work boring and unfulfilling. Abstract work is usually the opposite. The workforce is well-educated, well-paid and highly autonomous. Many abstract workers are deeply committed to and fulfilled by what they do. The problem is that there are relatively few abstract jobs as compared to manual jobs. Indeed, the paucity of such jobs is partly driven by the effect of technology: it takes longer to educate a well-paid abstract worker, and they are able to gain larger market shares, with less human input, thanks to the automation of lower-skill jobs. Thus, the effect of automation is to drive relatively more workers into the more precarious, lower-paid, less-fulfilling, and less-rewarding types of work. This is how Loi supports premises two and three. Premise two is supported by appeal to evidence relating to the polarisation effect and predictions about its future. Premise three is supported by the effects of more precarious, lower paid, less-fulfilling, and less rewarding types of work. Loi’s belief is that they are likely to have a ‘disenhancing’ effect. What are the implications of this argument? Loi discusses several. Two stood out for me. First, there was his focus on the basic income guarantee as one way in which to ameliorate the negative effects of technological unemployment. This is not surprising since many make the same argument, but Loi does link it directly to concerns about disenhancement and not about social inequality more generally. Second, there was his discussion of biomedical enhancement as a way in which to correct for the disenhancing effects of technological unemployment. In other words, enhancement via the biomedical route may be a necessary countermeasure to disenhancement via the automation route. This is something I have argued in relation to the political effects of automating technology, and something I also discuss in an upcoming paper. Is the overarching argument any good? In general, I agree with Loi that one can usefully fuse together the debates about technological unemployment and human enhancement. Indeed, I think it is worth doing so. That said, there were two omissions from the article that bothered me. The first was that I don’t think Loi did enough the emphasise the merits of the anti-work position. Proponents of this view argue that non-work can be better for an individual than work. Hence, there are ways in which technologically-induced unemployment could be a good thing and this could counteract some of the disenhancing effect. I have talked about this antiwork view ad nauseum on the blog before so I won’t repeat myself now. Safe to say, the antiwork view only really makes sense if the productive gains from technology are shared reasonably widely. If people are suffering from deprivation, and still being forced to find work, then Loi is aware of this, hence why he discusses the importance of the basic income guarantee. If ICT innovation leads to intrinsically worst [sic] jobs and low wages for most workers, technology will disenhance more workers (in the welfarist sense) than it enhances. This seems, unfortunately, to be the present trend. As best I can tell, he makes no attempt to argue for disenhancement in the functional sense. He might be able to do this by, say, arguing that manual workers suffer from a reduction in capacity and ability. But it's not obvious to me that this is true. They may not have their mental abilities expanded, but their physical abilities could be. Furthermore, there is an argument out there to the effect that the kinds of automating technology used by abstract workers can have a (functionally) disenhancing effect. Nicholas Carr makes much of this in his recent book, claiming that assistive technologies often lead to the degeneration of mental abilities. I’m not endorsing that argument here (I discussed it at length on a previous occasion) but it adds an interesting angle to Loi’s argument. It suggests that the disenhancing effect might be broader than he suggests. Anyway, those are just some quick — no doubt poorly thought-out — reflections on Loi’s article. I’m thinking a lot about the relationship between the enhancement debate and other techno-ethical debates at the moment, so I will continue to explore these issues.